It is with great joy we announce the dates for the highly anticipated Snowboard World Freeride Championship 2015 in Valdez, Alaska. The contest is scheduled for the 4th of April 2015 during the infamous World Freeride Festival: Tailgate Alaska which brings together more than 500 freeriders from around the world to Thompson Pass outside Valdez for ten days in 2015 April 3-12. This 4000 ft. ridge is littered with chutes, corniced ridges, pow bowls, cliffs of all sizes and plenty of steep technical lines. Sluff management and big mountain skills will be tested. Skatepark is a mountain that has everything a snow rider would want. It has the most amazing natural halfpipes, quarterpipes, booters and kickers. There are plenty of open pow bowls, steep face riding, chutes and cliff sections. The event will consist of two judged runs down Brobowl then one judged run down Skatepark. 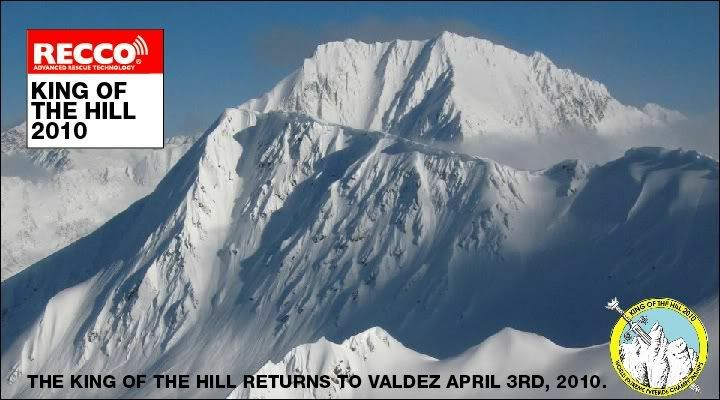 Founded in 1993, the King of the Hill snowboard contest not only put the Valdez snowboarding scene on the map, it helped define an era of the sport. For the first time in 10 years the King of the Hill returns to Valdez, as part of the Tailgate Alaska World Freeride Festival as a rider-judged, big-mountain freeride and freestyle contest. The King of the Hill Freestyle will be set on powder-drenched 4,000-plus feet of vertical, demanding massive airs, cro-magnon leg strength and cat-like board-handling agility. Essentially, it’s the ultimate test of a professional snowboarder in one run. The one-day contest is slated for Saturday April 3, 2010 (the 4th, 5th, 6th and 7th will serve as weather days). • Big-mountain freestyle snowboarding contest. • Cash prize purse and a trophy. • Invitational field with a few wild-card spots. Top pro athletes, Olympians and veterans will be invited to participate. • Extensive international media coverage online, in print and in video. • 40 Total competitors: 32 men, 8 women. • Bringing back a legendary snowboarding competition.